Q1.Please tell our readers something about yourself and MM Racing. I came to cycling via cyclocross about eight years after I completed last track and field season running the 400 hurdles, finished my massage therapy program, finished my BFA, started my own massage business and worked several years as a soigneur for pro cycling teams. My first CX season was just for fun on a local women’s club team. 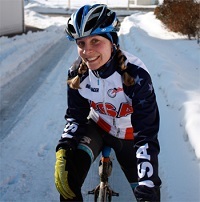 My third season, I was racing well and being coached and focused on Masters Nationals which I won, but really took off at Nationals where I (surprise to everyone) got 3rd in the Elites and earned a spot on the U.S. World’s Team. It took me several years of struggling to balance work and racing and to find any financial sponsorship to help offset the cost of racing. When my husband Matt and I created MM Racing (our own team) it was out of the realization that we were footing the bill and doing all the legwork to run our own 2-person team and acting as our own title sponsors in a way. MM Racing has since become a marketing vehicle for us and a way to present ourselves to perspective sponsors in a professional and marketable way via our newsletters, social media presence and website. I have just completed my 10th season of racing Elite cyclocross and have been lucky enough to travel the World racing while being a working-Pro. Q2.As an athlete, have you personally ever benefited from physical therapy? Can muscular therapy speed up the post-injury rehabilitation process? I have been more than lucky to not need PT during my own racing and training, however, my husband suffered a major injury in 2006 fracturing his femoral neck requiring immediate surgery and 12 months of PT to get back to form. As a muscular therapist, I work specifically with orthopedic and injury rehabilitation and have my clients communicate with me and their PT to assure we are doing complimentary work to help improve their post-injury or post-surgical rehab. I find working in tandem with a PT is an ideal situation and I see the best results this way, as our work is complimentary (diverse techniques and approaches to tissue and joint manipulation) rather than redundant. Q3.Is it possible to integrate yoga with a muscular/physical therapy program? I am also trained as a yoga teacher and have been personally doing yoga for over 14 years. I also practice Thai Yoga Massage (the practitioner guides the client through a series of yoga postures, while palming and thumbing along the body’s energy (‘Sen’) lines and pressure points) and find the two practices completely complimentary to integrate into a single session in my office or as a suggestion of self-care for clients. Yoga is an excellent way for clients to begin to tune deeper into their own bodies, sensations, and emotional states rather than to be only manually manipulated by a practitioner such as PT and MT. I have found a significant differences in the rate of rehabilitation in clients seeking “someone else to fix them” versus being a willing participant to their own wellness. Q4. In many sports, including cyclocross, it is common to see teenagers who push their bodies to the limit, resulting in injuries. What advice would you give to young cyclists for having a long and injury-free career? well after injury had been sustained and was only to those who could afford it. I personally don’t believe many high level athletes are ever 100% injury free as repetitive stress of any kind eventually creates symptoms, but learning to become aware and listening to your body early on can go a long way in preventing long term injuries. Q5. As a vegan, are there any dietary issues you face as an athlete? Any tips for runners and cyclists who want to go vegan but are worried about how the change in diet will affect their performance? Most people that do have questions or concerns that are mostly due to misinformation or lack of information regarding nutritional requirements such as protein, calcium and B12 for vegan athletes. I try to educate myself as much as possible via research articles and data on performance and the vegan diet. I’d encourage anyone considering any dietary changes to educate themselves first on the benefits and possible disadvantages of changing diet before taking any measures. I recommend having annual blood work from your health care provider to gauge your baseline and make changes as needed based on those data. Be mindful that making dietary changes based on environmental, performance or ethical non-medical reasons, such as vegetarian, vegan or gluten free are choices of privilege and be expensive and laborious at first to integrate in a healthful way. Start with small changes and build to the level that is both sustainable and appropriate for you. Q6.How do you prepare, mentally and physically, for a tough race? My high school track coach Joe Casey is still in my head and I’m forever thankful for some of his simple and poignant advice: “Do what you’ve trained to do. No superhuman performances today.” I’ve always loved the simplicity of trusting that if you’ve put in the hard work and done the training, you will perform at the level you are expecting. There won’t likely be a sudden “superhuman” miracle performance coming out of left field, but you can trust that you can do the job you have trained for. It’s calming for me to trust the physical and mental training process to yield the expected results come race day. That is to say, if you’ve slacked on training or on mental preparation, some pretty poor results can come from that as well.